A brutal police crackdown on youth protesters occupying the central square of Barcelona has backfired against Spanish authorities. Early on May 27, over 120 youth were injured when police shot rubber bullets and beat protesters with batons in an attempt to clear the square under the dubious pretext that a soccer celebration might take place there later. This is the most recent development in a protest wave led by youth that has mobilized hundreds of thousands in over 150 Spanish cities and towns and sparked dozens of solidarity protests around the world. It is widely dubbed “the May 15th Movement” (M-15) for the day protests began. What was initially a modest protest of hundreds in Madrid ballooned when police attempted to forcibly clear them out of the central plaza. Soon the youth had seized the attention and support of large sectors of Spanish society—surprising most analysts. The most widely cited reasons for the protests have been the 40% unemployment rate faced by youth (21% for Spanish society at large) and the lack of any economic assistance offered from either major party—the liberal Socialist Workers Party (PSOE) or the conservative Popular Party (PP). In short, Spanish youth are facing a life with less opportunity than that of their parents, and they feel the current major parties won’t do anything about it. This explains why the youth called for a total abstention of the municipal and regional elections held a week after protests began. The results of the election—the worst for the ruling PSOE since the fall of the Franco dictatorship—have been touted by some as proof of a rightward shift in Spanish society. But the PSOE lost three times the amount of votes gained by the PP; indicating that more voters were fed up with both parties than those who actually switched to a right-wing vote. Furthermore, in the Basque region, a radical separatist coalition, Bildu, unexpectedly beat the PSOE—even winning the highest vote total of all parties in the region’s second largest city. Rather than a shift to the right, the election results point to a major crisis in legitimacy for the PSOE. Despite its nametag “socialist,” the Spanish Socialist Workers Party broke years ago from its roots in Marxism and the class struggle. The party continues to maintain ties to the trade-union movement but has moved more and more toward neoliberal free-market schemes and dismantling social programs—effectively ceasing to function even as a reformist workers party. Shortly after coming to power in 2004, the PSOE reached the height of its popularity, resulting from its withdrawal of Spanish troops from Iraq. But it has gone downhill ever since. The party’s bankruptcy is underscored by the fact that even after losing massive voter support in the recent municipal elections it has refused to reconsider the austerity measures. Some mainstream analysts have concluded that the elections have only deepened the divide between the masses who took to the streets and government officials in both major parties. When combined with the massive voter support given to the separatists in the Basque region, some have even implied that Spanish “democracy” is in crisis. But the only thing really in crisis is capitalism, or capitalist democracy, as the capitalist politicians only offer solutions to the economic recession that include destroying the living standards of the working class. The May 15th Movement, which is still in the early stages of formation, has a lot on its plate. In the short term the movement will likely face more police violence, as the PP and PSOE have both endorsed the idea that protesters should be cleared out of public squares. In the medium and long term, protesters need to establish deep connections with organized labor and other sectors of society (like immigrants) who can be allies in their struggle. Reports indicate that discussions are beginning—at least with the unions. M-15 will also have to decide how to relate to the national elections coming next year. The movement’s distance from and disgust with both major political parties is a great strength but still seems to lack ideological cohesion. Nevertheless, the Spanish youth have shown they are bold and determined, far beyond what most expected, and they have displayed high levels of organization as well. For instance, in Madrid protesters organized their own child-care center and legal assistance center in their protest camp. The May 15th Movement has called for popular assemblies across all of Madrid on May 28 and 29. These will be important opportunities for revolutionaries to reinforce the powerful idea of class independence and connect the struggle against austerity with a struggle against capitalism itself. Spain got rid of its dictator decades ago; for Egypt it was much more recent. But neither country has been able to free itself from the dictatorship of capitalism. The uprisings in Northern Africa and the Middle East—beyond merely inspiring others—have provided at least a basic template for struggle and resistance. There is wide speculation in the media that Spain might now provide a pattern for new protests in Greece, Italy, and other European countries where people have been hard hit by austerity measures. However, without building a movement that is clearly and consistently separate from the capitalist parties and prepared to challenge capitalism, these protests and uprisings will never be able to truly address the economic catastrophe that has sparked them. Stop police repression against peaceful protests! No to government austerity measures! Forward to a socialist economy! 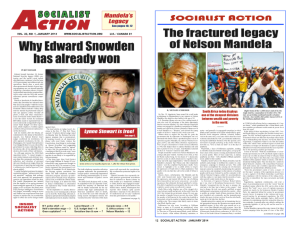 > This article was originally published in the June 2011 print edition of Socialist Action newspaper.